Attention: It is always advisable to consult your physician before starting a new workout, especially when you have had complications during this or a previous pregnancy. Being pregnant is a great time in your life, in which your body undergoes many changes to support the growth and birth of your baby. Traditionally, mothers were often advised to take lots of rest during their pregnancy. And though it is important to RELAX as much as possible, we now know that exercising while pregnant can be very beneficial for both you and your baby. Why Is Exercise During Pregnancy Important? What Is Moderate Exercise During Pregnancy? It can be especially crucial for you to exercise when you were already not moving enough before your pregnancy and/or living with obesity and other lifestyle-related diseases. The complications that arise while you're pregnant in this instance may be the development of gestational diabetes or pregnancy hypertension. Fortunately, pregnant women now have many options to stay active during pregnancy. Lamaze, Yoga and Pilates are good examples. Some pregnant celebrities even have special prenatal workouts developed for them. Before you jump on your next HIIT training though, be aware that running or jumping are not your best options. For instance, trampoline experts at Alice's Garden say that trampolines should be avoided after the first trimester, and you should discuss your fitness plans with your physician FIRST. You might not have the time or budget to have a personal trainer or hop off to the gym or yoga place on a regular basis. In that case, there are some great fitness routines you can easily do at home. To keep your muscles strong enough to recover after delivery, and to carry your baby around, here are five great resistance band exercises for pregnant women! Grab the ends of your resistance band and extend arms overhead. Stretch the bands out above your head until you feel a nice, comfortable strain. Then, lower the stretched band to torso level and return to overhead position. That cycle represents 1 full rep. You should try to hold that stretch for 1 minute or longer (if comfortable). However, if that is too much to start out, try to complete 30 repetitions of this exercise by holding the stretch as long as you can manage. As you do these exercises more often and become fitter, you will be able to tolerate the exercise longer. Grab the ends of your resistance band and bend over from the waist. Loop the resistance band around each foot (similar to Mickey Mouse ears) and cross the ends. Leaning forward and keeping your arms tucked close to your sides, you should pull the ends of the bands upward towards your chest and back down while squeezing your shoulder blades together. Once again, you should try to hold that stretch for 1 minute or longer (if comfortable). If that is not possible, try to complete 30 repetitions of this exercise by holding the stretch as long as possible. Grab the ends of your resistance band, position it around your back, and under your armpits. 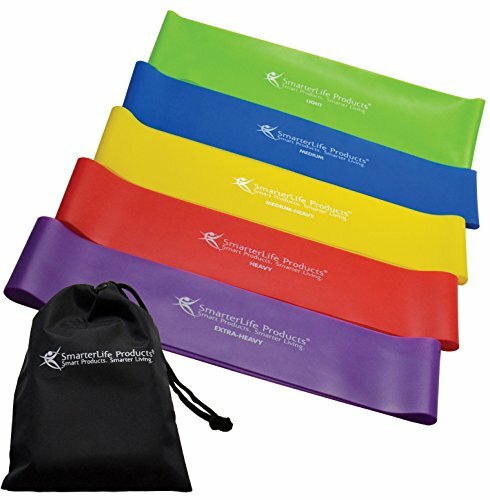 Wrap the ends of the bands around hands or use the handles if your resistance bands have them. Then, extend your arms out forward as far as comfortable, with elbows bent, and touch your hands together. Then, bring your arms back towards your chest. Again, you should try to hold that stretch for 1 minute or longer (if comfortable). If that is not possible, try to complete 30 repetitions of this exercise by holding the stretch as long as possible. This exercise requires the same placement of the resistance band and is an extension of the Opposing Muscle Groups exercise we covered in number 3. The difference is that once you extend your arms forward, with elbows bent, and touch your hands together initially, you continue this exercise by extending your arms out sideways and drawing your hands back together in the center. As with the previous exercises, you should try to hold that stretch for 1 minute or longer (if comfortable). If that is not possible, try to complete 30 repetitions of this exercise by holding the stretch as long as possible. Grab the ends of your resistance band and loop the resistance band under both feet so that you are standing on top of it. Then, wrap the ends around your hands or use the handles of the bands, pull in an upward direction (to the sky), and back down towards the ground. This is a simple exercise most people are familiar with but it is quite effective for bicep and core strengthening. As with all of these exercises, you should try to hold that stretch for 1 minute or longer (if comfortable). If that is not possible, try to complete 30 repetitions of this exercise by holding the stretch as long as possible. Listen to your body and do not overdo any of these moves. I hope they will help you to keep fit during your pregnancy, and will increase the speed of your recovery after delivery.